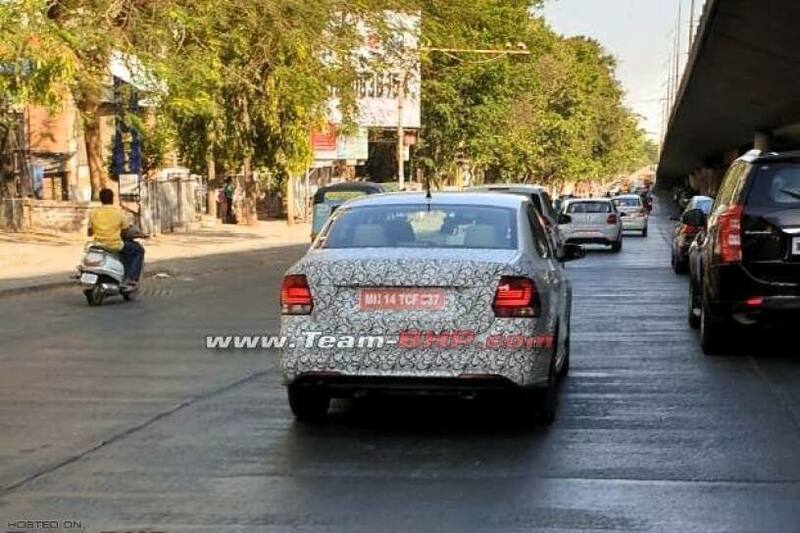 Camouflaged Vento and Polo are possibly hiding a restyled rear bumper. Expect the front fascia to also get subtle cosmetic changes. If the updated models are to come soon, expect powertrains to be carried forward. Before Volkswagen launches the second-gen Vento and Polo in India in a couple of years from now, yet another update for the Polo twins seems to be in the works. While the carmaker is yet to confirm this, a camouflaged Vento and Polo have been spotted testing in the country. Although the test mules are heavily camouflaged, we could spot a restyled rear bumper. It could be similar to the Russia-spec Polo GT (Vento is called Polo in the Russian market). In the Russia-spec Polo GT, the rear bumper gets a dual-tone finish, whereas the India-spec Vento comes with a single-tone bumper. We also expect other cosmetic changes on the Polo twins, similar to the Russian model. The front bumper and grille on the Russian Polo GT look similar to that of the now-discontinued India-spec Polo GTI, although with chrome inserts instead of the red highlights in the Polo GTI. Expect the updated Polo to feature similar design changes as the updated Vento. If launched in the coming few months, the updated Vento is expected to carry forward the same set of petrol and diesel engines. The petrol Vento is available with two engines: a 1.6-litre unit producing 105PS of power and 153Nm mated to a 5-speed MT and a 1.2-litre TSI engine good for 105PS and 175Nm with a 7-speed DSG. The Vento diesel is available with a 1.5-litre diesel engine producing 110PS and 250Nm. It can be had either with a 5-speed MT or a 7-speed DSG. However, with the introduction of BSVI in India from April 2020, VW might offer the Vento here in petrol guise only. The carmaker might introduce the 1.0-litre petrol engine from Polo and Ameo on the Vento. In that case, though, the 1.0-litre unit will be available in turbocharged avatar, making more power and torque. Along with the Vento and the Polo, Volkswagen is also expected to update the Ameo. The updated Ameo is expected to look similar to the current Vento. It could get Vento-like horizontally slatted chrome grille, new front bumper and tail lights. The updated Volkswagen cars are expected to go on sale later this year. Expect their prices to be largely similar to the current models’. While the Polo is priced from Rs 5.70 lakh to Rs 9.70 lakh, the Ameo and the Vento are priced from 5.82 lakh to Rs 9.99 lakh and 8.63 lakh to Rs 14.32 lakh, respectively (all prices ex-showroom pan-India).